Knowing that cats need meat protein to survive, Fussie Cat developed formulas that they call Physiologically Correct, creating wet and dry foods that are full of quality meats like boneless chicken, duck, tuna, shrimp and prawns to make sure your little carnivore is getting the protein-rich, feline-appropriate diet she needs. Plus they use FDA-registered kitchens—the same kitchens that produces canned food that's fit for people to eat. Thorough quality inspections are conducted daily for food safety, heavy metals, pathogens, contamination and pesticides. Here's the super cool thing about Fussie Cat: Instead of just assuming what kind of food cats will like (good luck with that! ), Fussie Cat lets them call the shots! Each recipe is co-created and taste-tested by cats to make sure your own kitty will love it. How pawsome is that??? 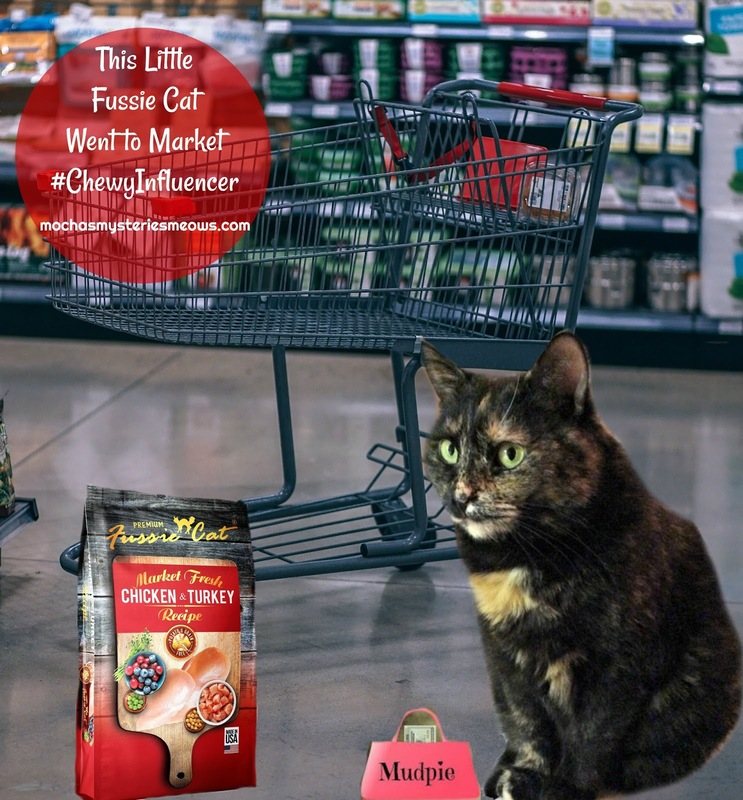 Fussie Cat Market Fresh grain-free dry food comes in 3 flavors - chicken & turkey, salmon & chicken, and just plain salmon. I chose the chicken & turkey, and I pawsitively adore it!!! I've eaten it every single day since the bag arrived and it's now a regular part of my meal rotation. Once I've emptied the bag you can be sure we'll be ordering more! By coming in a handy 2 pound bag anyone can give it a try without committing to a huge amount, and it's currently on sale for only $7.99! Once you make sure you like it, it's also available in 4 and 10 pound bags. Chewy offers FREE 1-2 day shipping for orders over $49, and with over 500 brands in stock they have something sure to make every cat or dog happy. Tell them Mudpie sent you! I've been hearing about Fussie Cat for years... but my human says that none of us are particularly fussy! I bet we would eat it anyhow! I've never heard of Fussie Cat, but it sounds great! If it’s Mudpie approved, it must be good! We're not fussy but we think that looks yummy! Mmmm, this sounds delicious, Mudpie! I'm wondering now if I should have had the kitties try this out this month. I'm just so afraid to touch their current dry food, as that is the only food all of them will consistently eat. I'm thinking we'll give it a try anyway. Happy snacking, Mudpie! Great review, Mudpie! I like that there's a 2 pound bag so you can see if your cat likes it first. We love the name and love your information on this food! We'll check the list of nutrients to see if it might work in our household. Thanks! Nice review Miss Mudpie, that sounds good. We’ve tried this food and found it to be really tasty too. 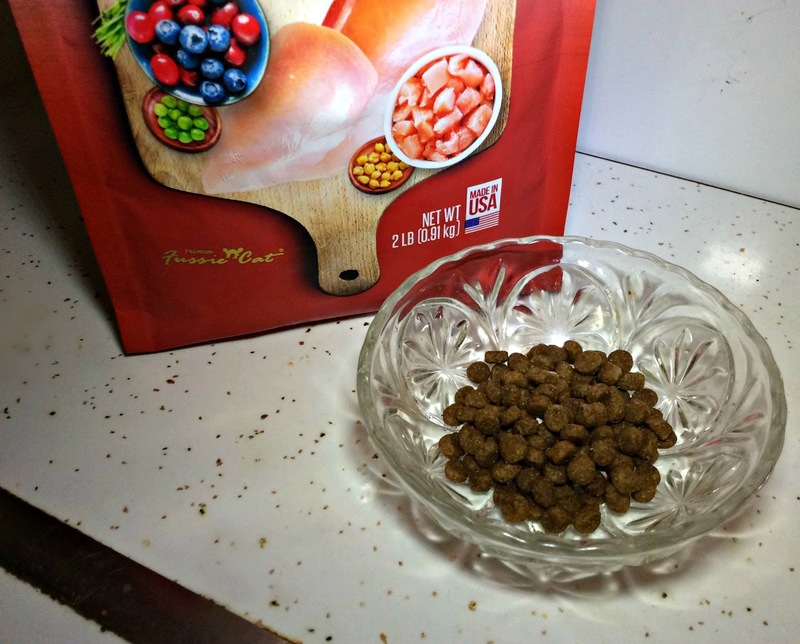 And the Fussie Cat wet food is even better! Zulu, Frodo and Amarula are drooling! As you know, I love Fussie Cat too. 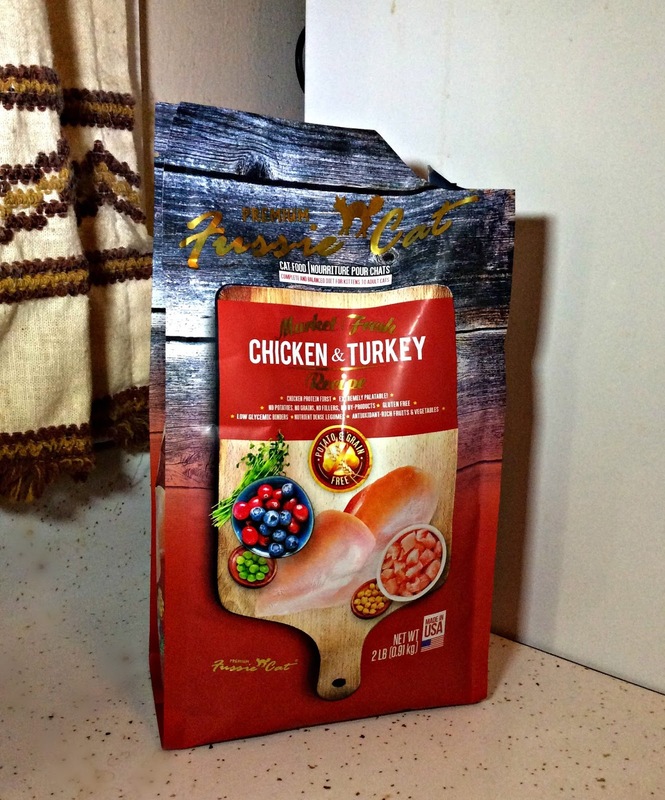 TW and I were both p.o.ed that they only let us try the 2-lb bag so we gave a 2-lb review. MOL! TW better order a bigger bag to our next autoship.